A loaded slate of four new films tries to revitalize the box office this weekend, which has seen mostly disappointments since the opening of the Pirates of the Caribbean sequel. Will Ferrell has been on the cusp of superstardom for some time now. The SNL alum has had several minor hits since leaving the show, starting with Old School and moving through Elf and 2004's Anchorman: The Legend of Ron Burgundy. It's the formula of this last film that seems to have clicked for Ferrell, with him and Anchorman's director Adam MacKay cribbing from it for Talladega Nights: The Ballad of Ricky Bobby. 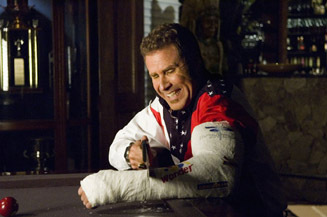 Ferrell stars as the titular character, a typically clueless Ferrellian blowhard, this time a top racer on the NASCAR circuit. His trials and tribulations to reach the top and defeat a foreign interloper to the circuit (played by Sacha Baron Cohen) form the bulk of the movie, with wacky antics and non-sequitors abounding. This may be the film that propels him into a Sandlerian stratosphere of film comics. His audience has slowly been building, with Anchorman being a tremendous video hit. The addition of the NASCAR theme, along with some truly killer jokes (Help me, Tom Cruise! ), could push this one over the edge. It's getting a huge push from Sony, who is releasing it in over 3,800 venues. Look for this to easily take the weekend crown with about $42 million. For the third week in a row, we have a new CGI animated film in release, as studios attempt to kill that golden goose but good by saturating the market. This time it's Paramount's turn, with Barnyard. Seemingly borrowed from an old Far Side concept, Barnyard follows the lives of farm animals who party while their farmer's away. Apparently there's some barnyard code that they can't reveal their true nature to humans, though you wonder if they'd keep to it if they realized the end goal of a farm. But I digress. Kevin James, of TV's The King of Queens, plays Otis the cow (who, and this probably explains some of his odd behavior, is a male cow with udders), who longs to rebel and see the world. Other celebrity voices include Courteney Cox, Danny Glover and Steve Oedekerk, who also wrote and directed the film. Oedekerk was responsible for Kung Pow: Enter the Fist and all those "Thumb" films that litter the video store, like Thumbtanic and Bat Thumb. So, you know the level of comedic genius we're dealing with here. Last week's The Ant Bully gave evidence to the notion that the days where a crappy animated film can open to big numbers based on celebrity voices and flashy scenery are over, and I see nothing too special about Barnyard's stale anthropomorphic jokes to change that. Give it about $9 million for the weekend. Late summer tends to bring out more horror flicks as opposed to the usual popcorn fare earlier in the year, with The Descent being the first offering of that genre in several weeks. A sort of blend of Pitch Black and Aliens, this film sees a group of six female cave explorers trapped after a collapse, which in turn has disturbed a predatorial subterranean race of creatures. Isn't that always the way?